This past Easter (which at the time of this writing was less than a week ago), my mother and I were trying to figure out what we could do to take in as treats to my daughter’s first grade class (which only has 7 kids). My mom remembered the candy-making supplies and chocolate she had stored away, and we finally decided we’d try to make little candy pieces for the kids. She dug through her stored Easter stuff to see what kind of molds she could find and came up with those old green Jell-O Jiggler molds – you know the ones I’m talking about? She remembered trying to actually make the Jell-O eggs with them (I didn’t), and she said it never did turn out right for her. But I got the bright idea to pour our melted chocolate into them and see if we could make huge solid chocolate eggs. I was a bit skeptical, to be sure, but my curiosity won out, and I decided to give it a try. Well, it turns out the whole thing was a lot messier and more time-consuming than I thought it would be. But, more importantly (and the thing that completely turned us off making 7 whole gigantic eggs) was the fact that it took a LOT of chocolate to fill in those Jell-O egg molds. I mean, we’re talking ONE bag of chocolate made about 2.5 eggs! 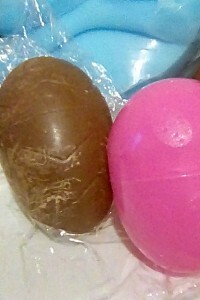 So, we filled up two of the egg molds (so my two little girls could each have one for Easter), and we poured the rest of our chocolate into much smaller Easter candy molds to share with the class. When it was all said and done, the eggs did turn out pretty well (although one had some slight discoloration to it – I think because I paused in between pouring the melted chocolate because I ran out and had to melt more). I was thrilled with what we ended up with, although neither of my two girls seemed very impressed. They liked the little chocolate pieces a lot better. Go figure. Maybe they just found the prospect of eating the huge chocolate eggs too daunting. I think I’m going to have to cut them up into smaller pieces to actually get my kids to try eating them. 1. 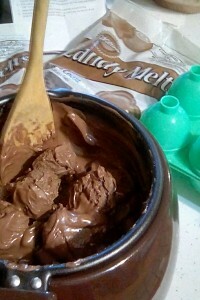 Melt one bag of candy melts in the double boiler or chocolate melting pot. 2. Spray the insides of the egg molds with non-stick cooking spray. 3. Using a squeeze bottle, fill two of the closed Jell-O egg molds to the top. If you see bubbles forming, tap the mold against the countertop a few times in between adding chocolate. 4. Continue melting and filling the egg molds until all 6 are full, if desired. 5. Stick the filled egg molds in the fridge overnight (or for about 8 hours). 6. Remove from the fridge. 7. Carefully open the top of the egg mold, and remove the chocolate eggs. These can be stored at room temperature until you are ready to serve them.